However, even though I have set slide to "resume saved state", the previous and next buttons don't show when the slide is revisited. I would think if they had met the criteria to show previously, that resuming saved state should show the next and previous buttons. 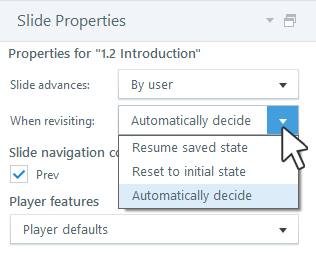 Resume saved state: Use this option if you want the slide to always remember its previous state. In other words, this option lets learners pick up where they left off when they leave the slide and come back to it later. Hi, Victoria -- It looks like there might have been an issue with the hyperlinks Wendy wanted to share, so here is the link for the tutorial, and below is the section she specified on Determining How Slides Behave When Revisited. Reset to initial state: Use this option if you want the slide to always reset to its initial state when learners return to it. It'll restart from the beginning of its timeline, and interactive objects will return to their initial states. Automatically decide: This is the default option. It means Storyline will decide whether to resume or reset the slide based on the objects it contains. Here's the logic: If the slide has only simple objects and/or audio but no interactivity, Storyline resets the slide to the beginning of its timeline. However, if the slide contains interactive elements, such as buttons or other objects that have a visited/selected state, Storyline resumes the slide where it left off previously. You may also want to take a look at this information, as well. Oh I see, Wendy! Thanks so much, and all of the great advice you provide is truly appreciated -- sorry for the confusion! Thank you both, Wendy and Christie for the information. Yes, Wendy, the previous and next buttons advance to the previous/next slide. No Victoria I am not talking about the player navigation I am talking about the 5 icons that are clicked on that screen. Do they go to 5 separate slides or 5 layers on that original slide? I have created a sample file to see if this works for you. There are two offstage objects (2 buttons Next and Prev) which get triggered and a number of additional triggers. The slide is set' resume saved state' . I just put the offstage objects onto the slide so you can see them changing. Thanks Wendy. One thing I'm confused about is that you set the Next and Previous buttons to change state to Normal when the lightbox buttons are visited AND ALSO when the off-screen buttons are visited. I don't understand why we need both - ?? I'm still not clear why we need the extra buttons off screen?? I have attached the page and maybe you could tell me if I have forgotten anything. I have reworked your file. For testing I added in a lightbox slide and a next slide. 1. You can remove all the offstage buttons Prep hold etc...In my example I had two but you only need one - I have called this Continue. It sits offstage and has a visited state. 2. Your insertion pic didn't have a change of state trigger so the conditions for your next button would never have worked. 3. The order of your triggers are important. You have to change the state of the pics to complete before you jump to lightbox - otherwise you jump to lightbox and the change state trigger never fires. 4. The slide property is set to resume state. 5. The driving trigger that changes the next / prev buttons to normal is based on the offstage continue button changing to 'visited' which is triggered by all the pictures state = complete. 6. Using slide layers or lightboxes means your base slide timeline NEVER restarts so you can't use 'when timeline starts' except for the initial hiding of the next/prev buttons. Hope you didn't drive too far and hope this helps. Shout out if you don't understand anything. Wendy! you're a genius!! Honestly, Articulate should hire you! Thank you so much for making it work. You are the best. If you live in Sydney, I'm definitely taking you to lunch! Ha ha Victoria - so glad it worked for you. I'm a Sydneyite living on the Gold Coast but regularly visit - see you at the next Articulate catchup! It's a date!! Where do I find the Articulate conference details? Matt Guyan from B-Online Learning usually organises. Here are a couple of forum links so you can stay updated! Subscribed! Thanks again, Wendy! I do hope we can meet one day so I can thank you for all of your help in person! "Hi Victoria I have reworked your file. For testing I added in a l..."
"Matt Guyan from B-Online Learning usually organises. Here are a co..."
"Hey Victoria the 'resume saved state' is for the objects on screen..."